The center of the painting has a yin-yang symbol which, as always in my paintings, represents change which is one of the fundamental constants of the universe and everything in it. All things change. All things manifest out of the Infinite Potential and all things eventually disintegrate back into the Infinite Potential. The yin-yang symbol represents the engine that drives virtually everything both physical and spiritual in this reality. The universe is in a constant state of unrest. The hands represent mankind. The primary colors of red, yellow and blue represent all the races of humanity. 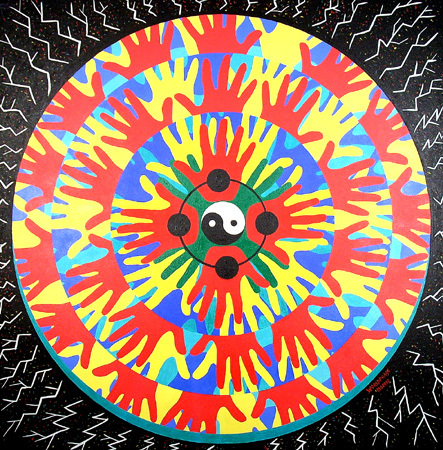 The center set of hands are green and the fill in color around the red, yellow and blue hands is turquoise (blue) which represents the land and the water of earth. The hands represent humanity's attempt to control the earth. The circle connecting the four red hands at the center of the painting represent the interconnectedness of humanity. All races, nations and religions are bound together as one humanity. The hands move out from the center of the mandala toward the edge of our planet, solar system, galaxy, universe and into the great void. Outside each level of reality that we define is the constant change of an unfolding Infinite Potential that newer ceases to create and manifest while at the same time destroying its own manifestations and creations for ever. The lightning surrounding the mandala represents the Infintite Potential (the infinite God if you will as opposed to the personal gods). As the lightning strikes it throws off worlds, universes, dimensions and realities which are represented by the splashes of primary colors around the lightning. As we in this dimension/reality and on this earth reach out, we create and contribute to the chaos within the universe and within the Infinite Potential. Everything is connected. The Infinite Potential is One. And within that oneness is the duality of all things in a constant state of flux and chaos; each forever struggling to dominate. We are at one with the Infinite Potential. We will never die because we were never born. This is the great mystery. It is represented by the dark back ground of the painting which represents not evil and negativity but the infinity of things that we do not consciously know. Why is this painting titled "Cheyenne"? Because that is what came to me when I was painting it. When I look at it, my first impression has always been that of a shield used by Native American warriors.